Children at an outdoor swimming pool, 1970. Can anyone identify the pool? 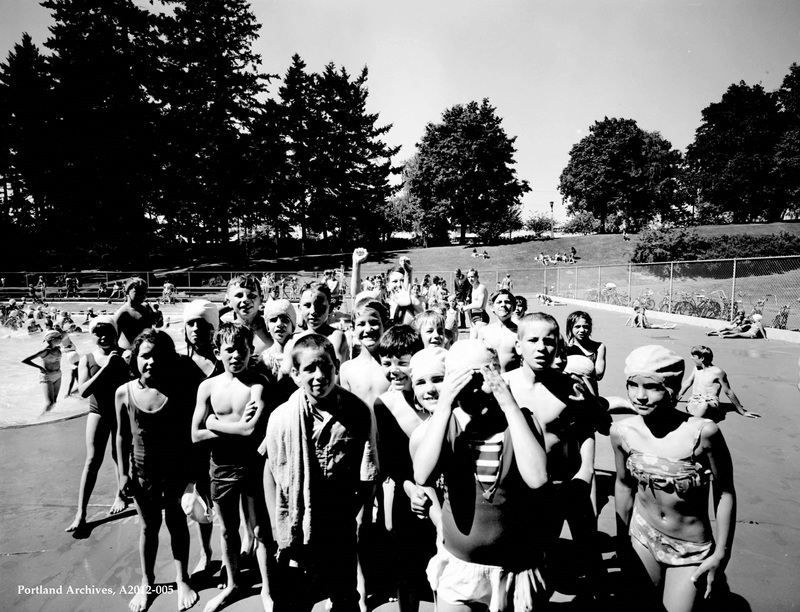 City of Portland (OR) Archives, Children at an outdoor swimming pool, A2012-005, 1970. Creston Park off Powell Blvd? Check out the bikes parked along the fence. Looks like a few Schwinn Stingrays there. Memories flood over me. Our little town in northern Idaho had a public pool. As a kid in the 50s and 60s, it was THE place to be every day during the summer. I still love the sounds of kids frolicking at a pool. Our pool was built in the early 30s and finally had to close this past summer due to the extensive, expensive repairs that were needed. ALAS! I think it’s Creston. Those quaint old park lamps, like the one seen in the right background between two trees, seem to have been replaced with modern square-shaped night-lights.Those neat old lamps with their soft glow were everywhere in Portland parks — I particularly remember them in Washington Park.Among the best things about being a kid in Portland in the summer was swimming in those park pools, and you can sure see that reflected in the kids faces!. I thought Creston as well but if you blow it up you can see Frank Ivancie. When was the LAST time you saw swimming caps on anyone, except for competitive sports. And remember how elaborate they got! i’m also curious about the kids in the middle giving the socialist/yippie/black power salute. teenage epater la bourgoisie? What’s the problem with the archivists for the City of Portland? Photos taken should be catalogued and identified at the time. Or are these images submitted by the public without identification? Curious…..
Not sure about that curved corner of the pool – don’t recall that at Creston. Ivancie was parks commissioner from 1967 to 1974. He was successful in getting the park swimming pools heated. He tried to get the “hippies” out of Lair hill park but that’s another story. Many people even now don’t know that he was a democrat. Ivancie, when he was mayor, got the at-grade crossing of SE Powell with the rail lines at 17th turned into the Powell underpass. I think he even got the RRs to pay for part of it. Prior to that the traffic jams were legendary.similar to what folks are complaining about now at 11-12th and Clinton with the Orange Max and all the rail lines. creston has curved edges. there is no doubt that this is creston; if you look at the street view i posted earlier, you can clearly see that the evergreens to the left and the horse chestnuts to center and right are the same. I agree, wl, when you compare the old photo with the current view, the trees are the same. It’s Creston. I love comparing the old and new photos of places around Portland, and it’s amazing how many of the old trees are still around, and thriving.